Entry to all 4 Millennium Series Trade Shows, and viewing of the SPL1, SPL2 and OD1 Field is free of charge - no tickets are required. We invite you to come and see teams compete to be crowned European Champions over 5 Divisions and 3 exciting days of play! 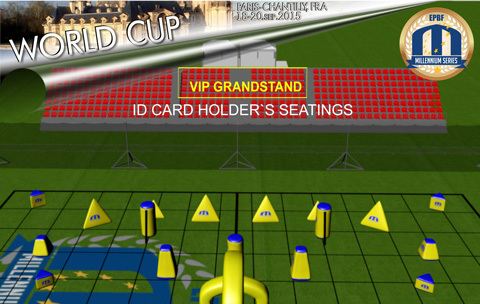 At both our French Events, the Mediterranean Cup and the World Cup, tickets are required for the main grandstand on the CPL field. Any persons with a MS ID card, do not require a ticket, entry to the grandstand is free for them. Entrance to the 2015 World Cup is, as always free and open to the public. A large grandstand will be available to watch games on the CPL field from, on all 3 days of the event. The grandstand is open and free, throughout the duration of the event, to all persons with a Millennium Series ID Card and wristband. This includes players, pit crew, sponsors and media. For Spectators, tickets are now available to purchase for the CPL grandstand. Tickets are required if you do not have a Millennium Series ID card.